Prepare the pasta as per their instructions and set aside once cooked. Add the ground beef to a pan and let brown for at least 2 minutes. Chop the tomatoes, garlic and pepper, and add to the pan with the beef. Season with oregano, salt and pepper to taste. Add the tomato sauce and mix very well. Prepare a pot with béchamel sauce by mixing the flour with the butter and finally adding the milk. Once the sauce thickens, add a bit of salt and pepper. Fill the pasta tubes with meat or roll themixture in the lasagna. 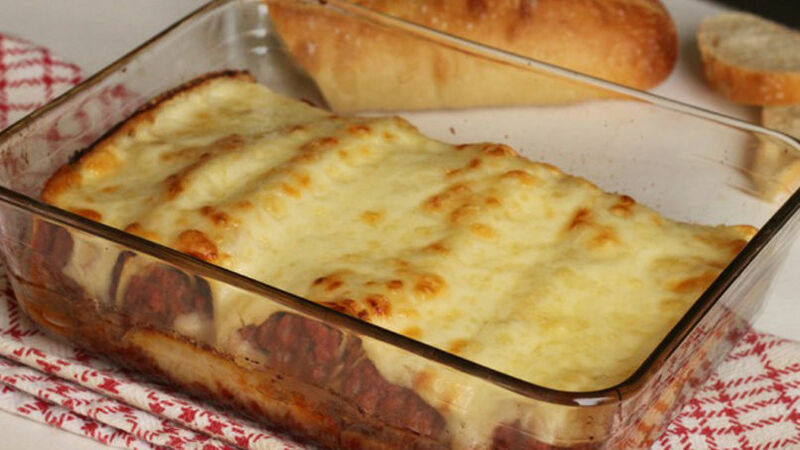 Fit the cannelloni in the baking dish, cover in béchamel sauce and cover each roll in a slice of cheese. Bake until they’ve browned and the cheese has melted. Serve immediately with pieces of bread. You can add other vegetables to the beef mixture, like mushrooms and carrots. I'm a big fan of pasta and this recipe might just be one of my favorites. I like it because I can take advantage of the sheets of lasagna I have in the cupboard. I fill them with an exquisite mixture that uses ground beef as the main ingredient. To make this dish even more delicious, combine Bolognese sauce with béchamel sauce. Serve fresh out of the oven with a green salad. Be sure to take advantage of the delicious sauce by serving with pieces of bread.